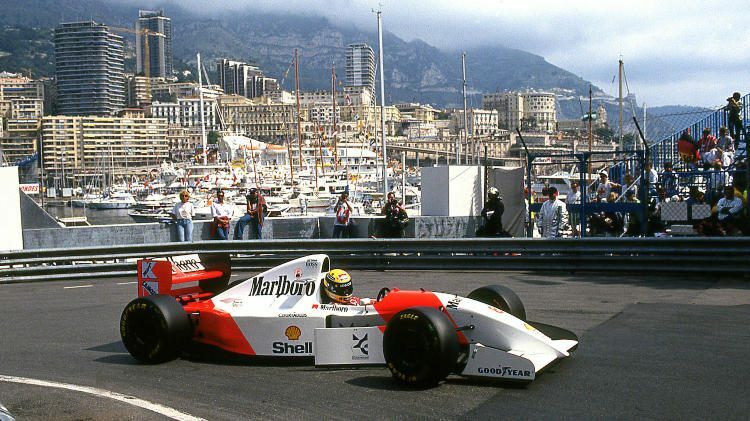 Bonhams will offer the 1993 McLaren-Ford MP4/8A Formula 1 racing car that Ayrton Senna drove to his record sixth victory at the Monaco Grand Prix at the Grandes Marques à Monaco sale. A highlight of the Bonhams Les Grandes Marques à Monaco sale in May 2018 will be Ayrton Senna’s 1993 McLaren-Ford MP4/8A Formula 1 racing car. Senna drove this chassis in eight Grand Prix races in 1993 but none more famous than his record sixth victory at the Monaco Grand Prix. Appropriately, Bonhams is offering this McLaren during the Monaco historic grand prix racing weekend 25 years after Senna’s victory at this most glamorous of Formula 1 Grand Prix racing circuits. The ex-Ayrton Senna, record-setting, final Monaco Grand Prix-winning, 1993 McLaren-Ford MP4/8A Formula 1 racing single-seater is to be offered at Bonhams Monaco 2018. No estimate has been announced. The 1993 season was Senna’s last with McLaren. The great team had just ended its long and successful partnership with Honda for engine supply, and would link up with Peugeot in a new Formula 1 racing partnership from 1994. For the interim 1993 season, a last-minute agreement had been struck with Ford to run their Cosworth-built ‘HB’ V8 engines on loan. Ayrton Senna was initially skeptical that these compact Ford V8 engines would be able to compete with the dominant Renault V10s as deployed by the Williams team, led by the Brazilian’s former team-mate and deadly rival Alain Prost. Senna consented to remain with McLaren on a race-by-race basis, in return for a rumored $1-million fee for every start. However, the team’s latest McLaren-Ford MP4/8A model – like chassis ‘6’ now being offered by Bonhams – demonstrated such technological and mechanical sophistication that by season’s end, it was one of the most competitive of all contemporary Grand Prix car designs. 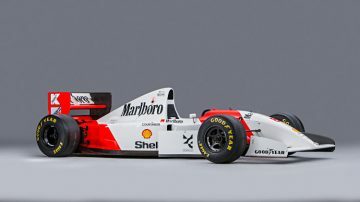 Ayrton Senna drove this actual car – McLaren-Ford MP4/8 chassis number ‘6’ – in no fewer than eight of the 1993 season’s Formula 1 World Championship-qualifying Grand Prix races. In his debut with the brand new car at Barcelona’s Spanish Grand Prix he immediately finished 2nd overall, headed only by Alain Prost’s Williams-Renault. For the following Monaco Grand Prix, he experienced an apparent problem with the car’s ultra-modern ‘active’ suspension system which sparked a violent crash into the barriers at Ste Devote corner. The incident unfolded so suddenly that even Senna was unable to let go of the steering wheel in time, and the impact painfully injured his thumb. Chassis ‘6’ was then repaired in time for Saturday running, and he qualified third fastest behind Prost’s Williams-Renault on pole and Michael Schumacher’s Benetton-Ford second. Prost then jumped the start, incurring a 10-second stop-go penalty, to be served in the pit lane. Schumacher then led the race from Senna until lap 33, when the Benetton-Ford retired with hydraulic failure. Senna promptly took control of the great race, 15 seconds ahead of Damon Hill’s Williams-Renault. As the great Brazilian took the Monaco chequered flag for his sixth time, he broke Graham Hill’s record for the most Monaco GP victories, set back in 1969. This McLaren MP4/8A was raced again by Senna in that year’s Canadian, French, British, German, Belgian and Italian GPs, finishing 4th at Magny-Cours (France), Hockenheim (Germany) and Spa-Francorchamps (Belgium). At Silverstone in the British GP, Senna looked set to finish 3rd, only to run out of fuel in the closing stages – being classified 5th. Chassis ‘6’s frontline career was then completed as spare car at both the 1993 Japanese and Australian Grands Prix. Monaco-winning Formula 1 racing cars rarely make it to public auction. However, in 2017, RM Sotheby’s sold the 2001 Ferrari F2001 that Michael Schumacher drove to his fifth and final Monaco GP victory for $7,504,000. Remarkably, the car was sold in a Sotheby’s Contemporary Art sales in New York rather than a traditional car auction. 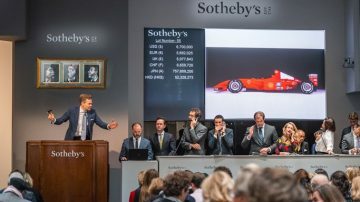 The result was a record for a modern Formula 1 car and well in excess of RM Sotheby’s pre-sale estimate of $4,000,000 to $5,500,000. 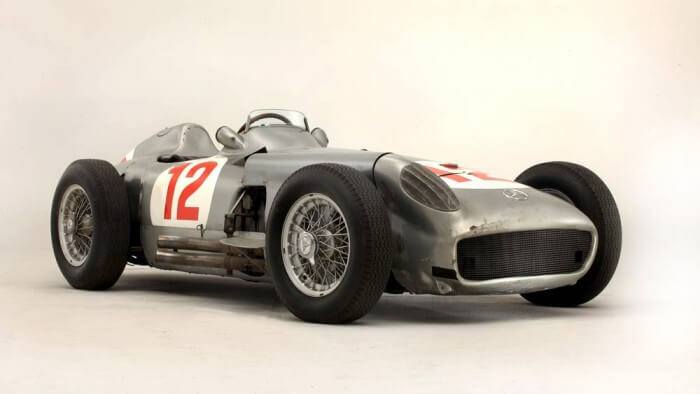 The highest price ever paid for a Formula 1 single-seater racing car was $29,650,000 for a 1954 Mercedes Benz W196R at the Bonhams Goodwood Festival of Speed 2013 sale. At the time the result nearly doubled the world record price for a car at auction. This Mercedes is still the third most-expensive car on record and most-expensive German car ever. Le Mans-winning cars are more frequent at auction. The 1983 Le Mans winner – a 1982 Porsche 956 sold for $10,120,000 at the Gooding Pebble Beach 2015 sale. 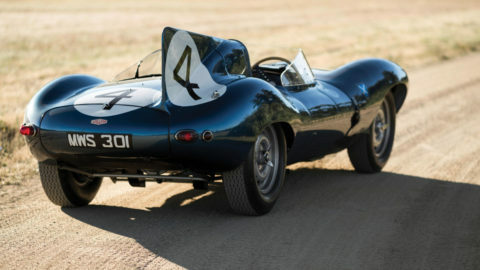 The record for a Le Mans winner is held by the 1956 winner – a 1955 Jaguar D-Type that sold for $21,780,000 at the RM Sotheby’s Monterey 2016 sale.